Sleep apnea can have a negative impact on your overall health, and on your personal relationships as well. If you or one of your family members have Sleep Apnea, you may have found that it's had some unexpected but significant emotional impacts in your family unit. Sleep Apnea goes hand-in-hand with poor sleep quality, and this poor sleep quality will more that likely be shared with the other person in the bed. So if you have sleep apnea and snore, or wake up frequently during the night, chances are that your partner's sleep is being disrupted as well. This can be frustrating for everyone involved, and can build resentment on both sides. Your partner will (understandably) feel annoyed, resentful and frustrated by the constant sleep disruptions, and you may feel the same way about the lack of understanding or sympathy. After all, you’re not doing it on purpose! Poor sleep quality can also have an impact on other parts of your life. Insufficient sleep you've been getting can make you feel lethargic, grumpy, irritable, and even depressed during your waking hours, and this is bound to have a negative effect on your relationships. Certainly with your partner (particularly if he or she is suffering from lack of sleep as well), but also with your other family members, friends and maybe even your co-workers. Sufficient sleep is critical for good physical and emotional health. If you have sleep apnea, it is crucial that you get it under control. While it's true that you can't help the fact that you have sleep apnea, you can improve your health and your relationships by seeking out help for your condition. There are many options for treating sleep apnea, from weight loss and lifestyle changes to oral sleep appliance or even surgery. 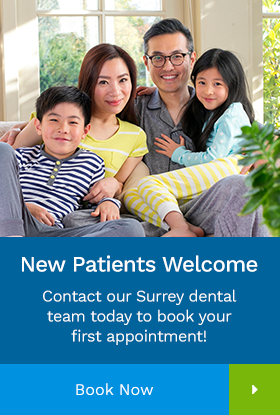 Our Surrey dentists are experienced in the diagnosis and management of sleep apnea. Contact us today - we can help!